CRMs don't have to be expensive or complicated. There are free systems which integrate neatly with Google apps to use the data you've collected already, and spending something like $10-$26 (or £8-£20) per user per month will get you some serious business management power. But whatever you're after, we've put together a list of top CRM systems, picking our favorites based on their relative features, cost levels, professional reviews and user experiences. Price: A free Starter plan is free for 3 users. Premium plans start at $8 (£6.30) per user per month. A 30-day free trial is available. Apptivo is a comprehensive CRM which provides an easy way to manage your contacts, schedules, notes, communications, tasks and more. That's not all: even the free account gets project management tools, invoicing, estimates, basic purchase order tracking, field service management and a helpdesk, although it only supports a maximum of three users. The $8 (£6) Premium account offers much more storage (3GB per user, up from 500MB for the free account), and plenty of valuable extras: bulk email, e-commerce integration, standalone business apps and Google Drive, Calendar, Tasks, PayPal and Dropbox integration. Crank it up to the Ultimate plan for $20 (£16) for even more data and campaign emails, as well as priority support. This kind of power comes with a little complexity, especially if you're new to this type of package. It doesn't take long to master the basics, though, and the system is so configurable that you'll soon have it set up to suit your requirements. Price: Premium plans start at $12 (£9.50) per user per month. A 14-day free trial is available. Pipedrive is a robust CRM solution sporting a user-friendly interface. Once configured, it can track all your phone calls, emails, and the entire sales process. It also keeps you and your team organized by putting the deals (ongoing transactions) due to the top of your interface. Setup is also simple and Pipedrive promises it can be configured in under two minutes, plus it connects to over a hundred apps, including Google, Yesware and Trello. Pricing starts at $12 (£9) per user per month, and there’s no limit to the maximum number of users. The company offers a batch discount for increments of six users. Price: Limited plan available for free. Plus plan available from $39 (£31) per user per month. Like Apptivo, Bitrix24 provides a vast suite of powerful business tools: collaboration, instant messaging, telephony, project management, document handling, scheduling, employee management, and more. 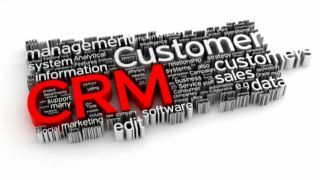 If you prefer to keep things simple then you can concentrate on the excellent CRM, which is a capable system all on its own. Contacts and communications are logged, leads assigned to sales managers, emails sent, calls recorded, quotes and invoices issued. Detailed reports keep you up-to-date and there's convenient access via the mobile app. Bitrix24's unusually generous free account supports 12 users and includes 5GB storage, but if you need more, the Plus account supports 24 users and provides 24GB online storage for $39 (£27). Price: Basic plan is free. Professional plan is $12 (£9.50) per user per month. A free 30-day trial is available. While some of the competition tries to win you over with the length of their feature list, Capsule CRM is different because it concentrates on the basics: contact management, collaboration, sales pipeline, scheduling and tasks. These are all well implemented with some useful features. You can track your customer's social media, attach documents and emails to their records, tag contacts or organize them in lists, create tasks and view your schedule in the calendar. The basic (free account) Capsule CRM solution is too lightweight to be useful with a maximum of 2 users, 250 contacts, and 10MB storage. However, the Professional plan – which costs $18 (£14) per month – deserves a closer look, and comes with support for lots of integrations including G Suite, Zendesk, Magento, MailChimp, Flow XO, Xero, FreshBooks, Wufoo Forms and more. HubSpot CRM stands out immediately for its pricing model. There are no unusably limited 'free' plans, no vast matrix of other accounts to browse – instead the core CRM is entirely free, and you only pay if you need to add extra sales or marketing modules. It's not all good news. HubSpot's reporting tools are only average and you may need to integrate with the free version of HubSpot Sales to begin to get the functionality you'll find elsewhere. But there's also a lot to like about the service, and it's certainly one of the best free packages around. Price: Free for 2 users. Plus plan from $29 (£23) per user per month. A 14-day free trial is available. Insightly is a powerful CRM with a strong focus on project management. As well as managing sales pipelines, you're able to set milestones, set and assign tasks, attach files and notes, define a schedule, produce reports, and more. If you're more interested in sales management, that's not a worry – there are plenty of supporting features. Insightly offers good contacts management, with social networking integration and mass email support. You get tools to collect leads and track sales opportunities, and the system can be viewed and administered from a mobile app. A capable set of apps enables integrating most of the tools you use already, including G Suite, Outlook, MailChimp, QuickBooks, Slack, Dropbox, Evernote and more. The free account is likely to be too restrictive for many ('mass' emails are limited to 10 per day), but it's better than most of the competition. If you need more, Insightly offers a range of powerful commercial plans ranging from $29 (£23) to $99 (£78) per user per month. Price: Single user plan from $10 (£7.90) per month. A 14-day free trial is available. InStream is a "sales, contact management and relationship automation tool", according to the developer, and that's not just sales hype. The system offers detailed contacts management, social media integration helps you stay in touch with customer tweets, and calls and emails can be logged so you're always up-to-date. This is often very easy to use, in particular because of its integration with other systems. Plug in your Gmail account and InStream will automatically download contacts and manage your email history, while syncing your account with Google Calendar keeps your tasks and schedule in one place. If you're flying solo, you can go for the so-called Freelancer package for $6 (£4.75), but you don't get any data storage, reports or support, and you're allowed a maximum of 500 contacts. The Business plan is probably the best value and gives you 10GB storage, up to 25,000 contacts, detailed reports and full support. Price: $19 (£15) per user per month. A free 14-day trial is available. As the social butterfly of small business CRMs, Nimble aims to help users manage social, team and customer contacts on one screen. All online conversations, including email, Twitter, Instagram and Facebook, are easily visible with Nimble's lightweight platform. This isn't hard to manage, either. Nimble can automatically go online to collect useful data about your contacts, including their Facebook, LinkedIn, Twitter, and Google+ profiles. Smart search tools enable locating the data you need on an individual, or sorting and filtering your contact list however you like. Nimble also provides extensive task management, sales and marketing tools, and many integration options: Google, a host of popular third-party apps, and management tools for Android, iOS, Outlook/Office 365, Google Chrome, Firefox, Safari and more. Price: Limited plan is free, Professional plan from $49 (£39) per user per month. A 14-day free trial is available. Streak is a lightweight CRM, a little simpler than most of the competition, and for many people that could be a good thing. There's no need to spend an age learning a whole new way of working because the system runs inside Gmail, giving easy access to the contacts, emails and files you have already. That doesn't mean Streak is short on features. In a click or two you can group or view related emails, add and track customer status, notes and more. 'Boxes' help you define where you are in sales or other pipelines, and it's easy to keep everyone in the business up-to-date on your progress. The free product has only basic CRM features and some significant limits on its 'boxes', but is still worth a try for small businesses or anyone interested in getting a feel for how the service works. The Professional plan lifts the data limits and adds reporting, task management, call logs/ meeting notes, 900+ integrations, API access and premium email support. It's yours for $49 (£39) per user per month. Price: Free edition for 3 users. Standard plan starts at $12 (£9.50) per user per month. A 15-day free trial is available. Zoho CRM is a flexible solution with a lengthy feature list: leads, contact management, social media integration, tasks, marketing and sales automation, web forms and more. If that's still not enough, the system can be integrated with many other Zoho products, including customer support, project management and web forms. Zoho's mobile apps give access to this data, and help you collect it. There are tools to locate leads on maps, log calls, take voice notes, record your customer visits, and more. Zoho's free plan is appealing, with handy Google Calendar integration and support for up to 3 users, but be sure to read the full product comparison. There are lots of limitations, and to really compete with the other products here you'll need to spend $12 (£9.50) or maybe $20 (£15.80) per user per month for the Professional plan.